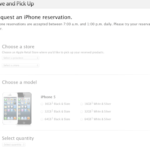 Three days ago Apple let the world know their new iMacs would be available on Friday (except the 27″ model). 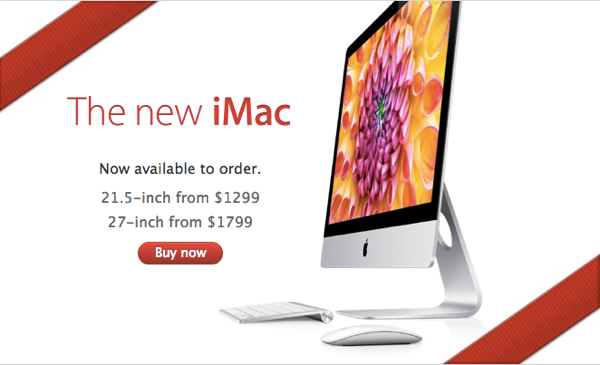 Just shortly after midnight tonight (PST) Apple made the new iMacs available for ordering online. The 21.5″ model shows availability in 1-3 business days and is also available at retail stores. The 27″ model is available for pre-order and shows 2-3 weeks for availability, for an arrival date in December as expected. Starting prices for the 21.5″ model is $1299 and the 27″ model is $1799. If you’re eligible for Education Store pricing (i.e. for students or educators), you can save $50 off the 21.5″ model and $100 off the larger 27″ model. 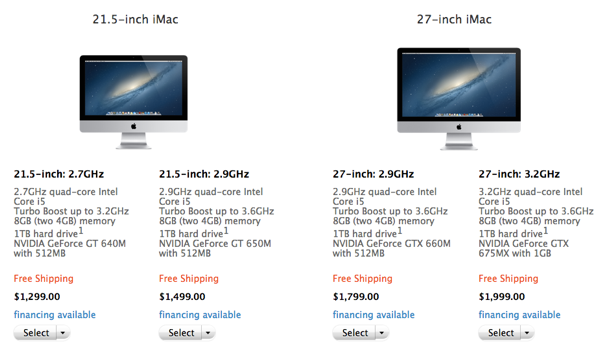 Anyone ordering an iMac today?